There are so many great restaurants in Guadalajara worth checking out. I spent four days in Guadalajara a few weeks ago and I wish I had more time there to enjoy all of the great eats. Every time I told someone I was going to Guadalajara, they had a restaurant recommendation for me. 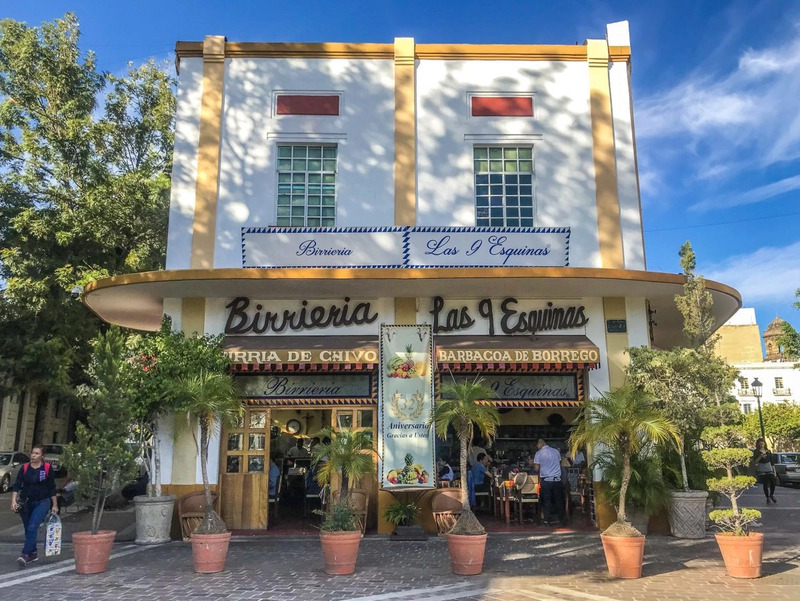 So this post is a huge compilation of all of the traditional foods to try in Jalisco, the best cafes, bars, restaurants, and cantinas to check out on your trip. 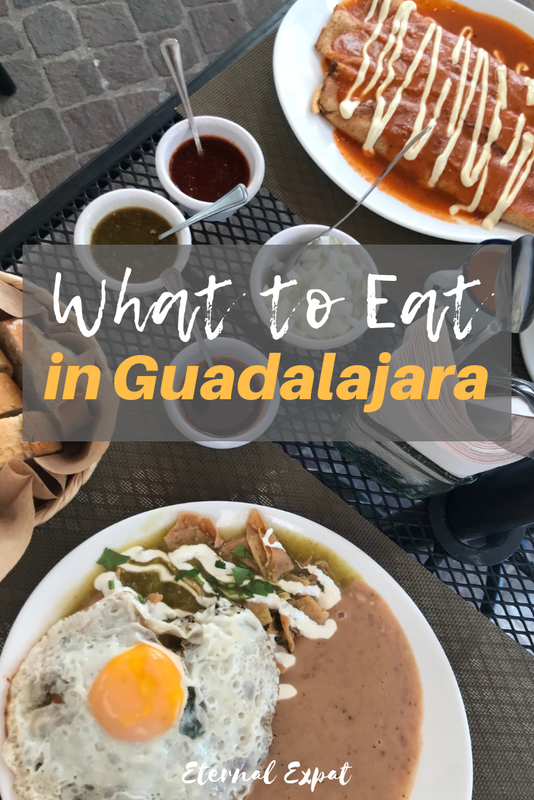 One of my greatest joys in life is good food, so I promise I left out all of the average eats and have only given you the very best restaurants in Guadalajara to try. The absolute best meal I had on my trip to Guadalajara was a plate full of birria tacos. Birria is traditionally made with goat, it’s slow cooked to utter mouth-watering perfection, and served with onions, cilantro, spicy salsa and tortillas. The best birria in Guadalajara (in my humble opinion) is at Birrieria Las 9 Esquinas. Las 9 Esquinas is a little square in the centro area of Guadalajara where you’ll be surrounded by several different birria restaurants. I’ve been told all are delicious, but I personally tried The food from this particular restaurant – it stands out in the square as the main one and the food was absolutely outstanding. 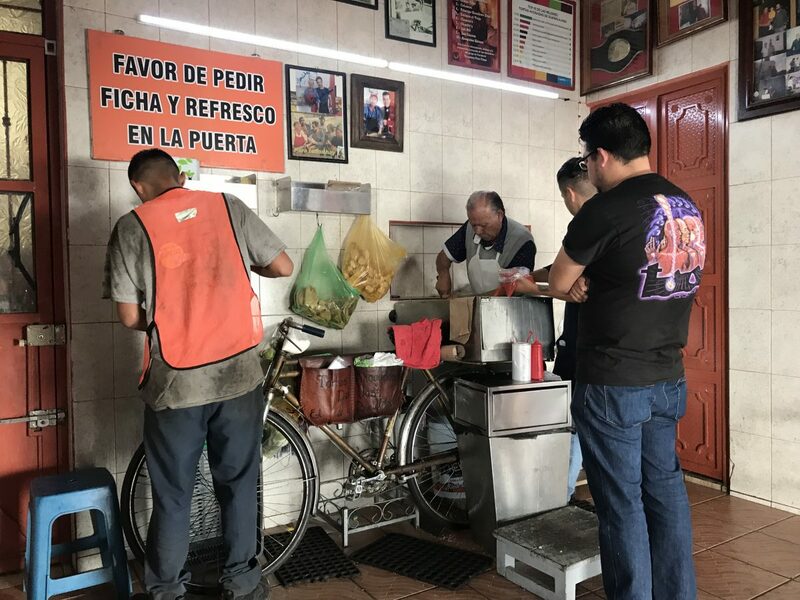 This is the birria place you want to look for when you get to the square. In addition to a plate of birria, we also had the consomme of lamb and an order of birria tacos. I highly recommend getting the tacos – the meat was absolutely perfect and then have some consomme to dip your tortillas into. Life doesn’t get better than this. You can pay with both cash and card here and they serve ice cold bottled beer. Carne en su jugo, or meat in its juices, is a beautiful idea and is executed better in some places than others. 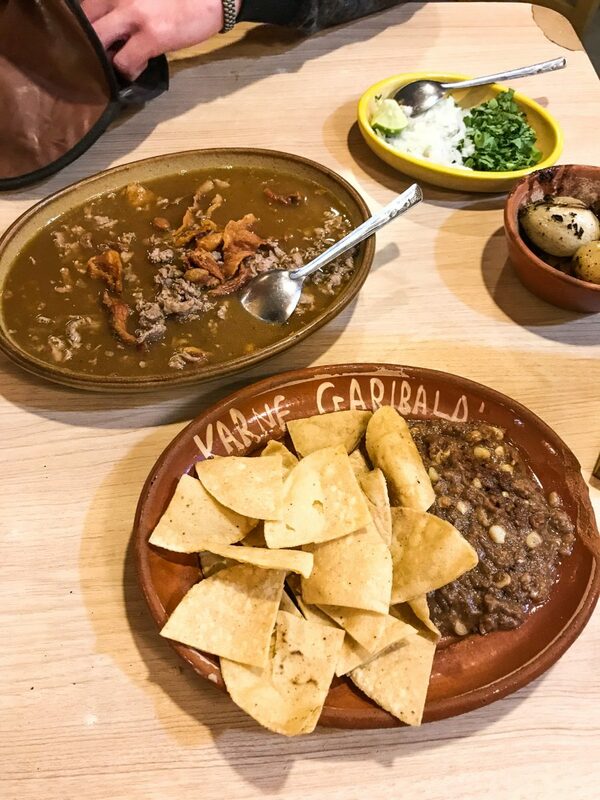 We had it a few times while we were in Guadalajara and I enjoyed the one from Karne Garibaldi the best. I guess there are a few locations around the city, but the one we went to (and our Airbnb host said this was the best one) was the location in Santa Tere. It’s a huge restaurant, but it specializes in this particular dish. Karne Garibaldi used to be best known for being the fastest serving restaurant in the world, which for a little while meant that the quality of the food suffered. When we visited (on a Saturday night around 9pm), the service was great and the food was delicious. They always bring a plate of tortillas chips and a hot refried bean dip to the table when you sit down and it is absolutely delicious. Locals love it so much they buy bags of it to take home with them. Luke and I shared a large platter of the carne en su jugo here and combined with the never-ending plate of chips (they give you free refills), it was more than enough food for us, and we’re hungry people. It doesn’t loook very delicious, but it tastes SO good. As does this bean dip. Another must-try dish that is as Guadalajara classic is the Torta Ahogada. You’ll see signs for this famous sandwich all over the city. I wish I had tried more than one so that I could make a better comparison for you. The basics of the sandwich are a fresh bread roll usually filled with carnitas (tender pork meat from all parts of the animal). Then its also filled with onion and sometimes other vegetables. Then it’s completely doused in a spicy red salsa. If you are getting it from a street vendor like we did, they put it in a plastic bag and then ladel in a bunch of sauce. Eating it is messy and slightly tricky to get the hang of at first. If you’re having it at a sit-down spot, they’ll put the sandwich on a plate and then ladel the sauce over the top. Whenever I saw people eating it this way, they used a fork and a knife. 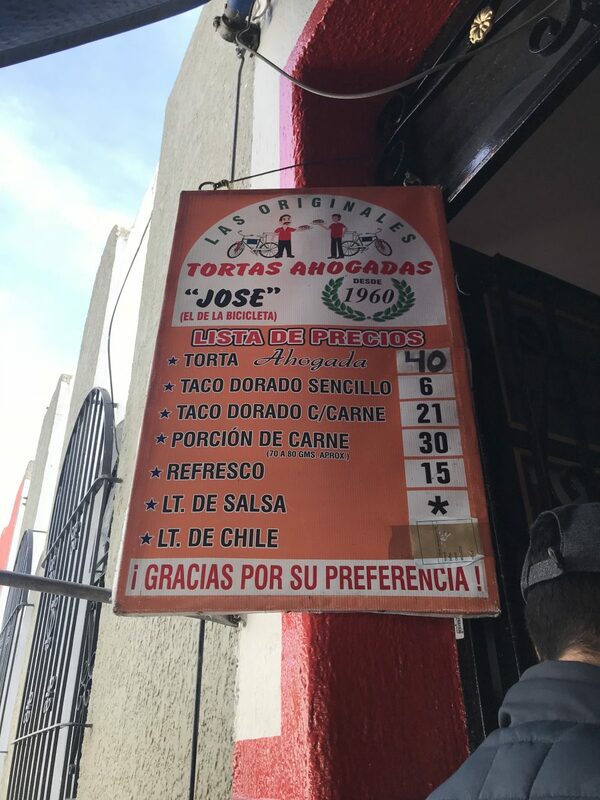 I googled in Spanish where most people recommend for the best tortas ahogadas, and the two places that consistently came up on every list were Jose el de la Bicicleta and Tortas Toño. I had mine from Jose el de la Bicicleta. It’s just off of one of the city’s main veins, Avenida Independencia. You can walk from the center (it took us about 15 minutes to walk) or you can take the blue metrobus. The things I loved about the sandwich were the quality of the carnitas – the meat was so good. I loved how fresh the bread was and I loved the flavor of the salsa. The salsa made the sandwich in my opinion. If you get one with a bad salsa, it probably won’t be very good. Things I didn’t love about the sandwich? It’s cold. I was not expecting it to be cold. I thought the salsa would be hot, I thought the carnitas would be hot. They were not. I also wish that the carnitas were covered in a sauce before being put into the sandwich. I felt like if I didn’t get a saucy bite that it was all sort of dry and bland. I really recommend having it more than once so that you can see what it’s like around the city and get a better idea of what the sandwich is all about. Very filling and very reasonably priced. The last dish that kept coming up as one of the must-try dishes that come from Guadalajara (or the state of Jalisco) is a bowl of white pozole. The number one place that was recommended to me again and again was La Chata. Unfortunately, I didn’t get to try it here as it was a little bit further away from my Airbnb than the closer La Gorda. I wouldn’t recommend La Gorda unless you’re looking for a late-night spot after a few drinks on Avenida Chapultepec. It was cheap and cheerful, but I thought the pozole here was not that flavorful. It did, however, come packed full with corn and fantastic pork meat both of which I really enjoyed. There are so many great restaurants in Guadalajara worth checking out. Besides the spots that I mentioned above, these are some of the ones that were most often recommended to me. I thought that this was just a breakfast place, and for that it should be visited, but it also has a really delicious-looking menu for lunch and dinner. Santo Coyote is in the hipster Americana neighborhood, where you’ll find a ton of cafes and restaurants. This restaurant consistently tops lists for best restaurant in Guadalajara. It should be high on your priority list to make a dinner reservation here. On weekends, it can be booked out for weeks in advance. It’s a combination of local and regional dishes that have been jazzed up into something much more gastronomic. I think of all of the “fancier” restaurants in Guadalajara (I put it in quotes because the prices of these restaurants are SO crazy reasonable compared to not just the US, but even Mexico City). Any restaurant with a charcuterie menu is a place that I want to spend a lot of time. They also have a killer wine list with plenty of Mexican-made options to enjoy alongside your delicious meats. I absolutely love the cafe culture that is alive and thriving in Guadalajara, especially in the Americana neighborhood. 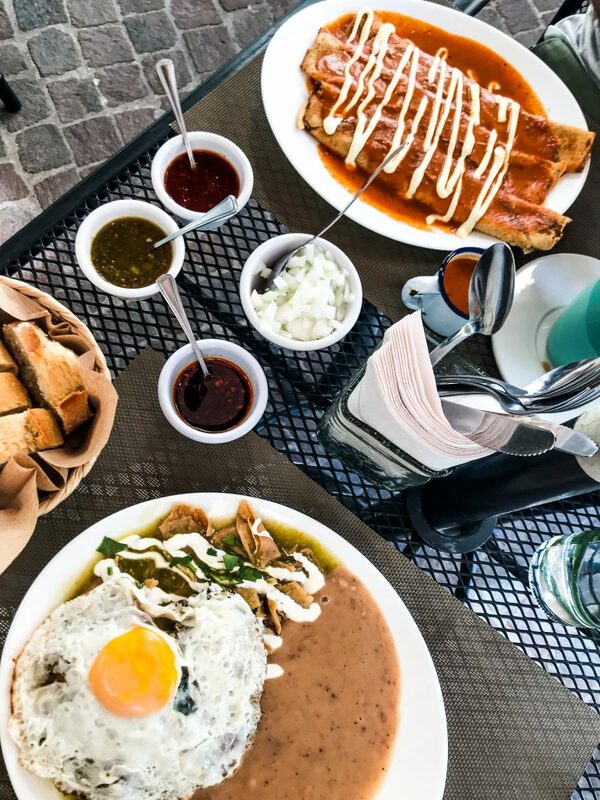 They all serve up delicious coffee, amazing Mexican breakfast options (you can never go wrong with chilaquiles) as well as more international options like crepes, waffles, and different styles of eggs. This colorful cafe is one of the better breakfast options in the centro area. I really loved their coffee and even once found myself heading there for an early afternoon pick-me-up. In the Lafayette neighborhood, this is definitely one of the more upscale cafes in Guadalajara. As the name suggests, this is a really great place for a coffee. They also have bakery items and a few small food options. 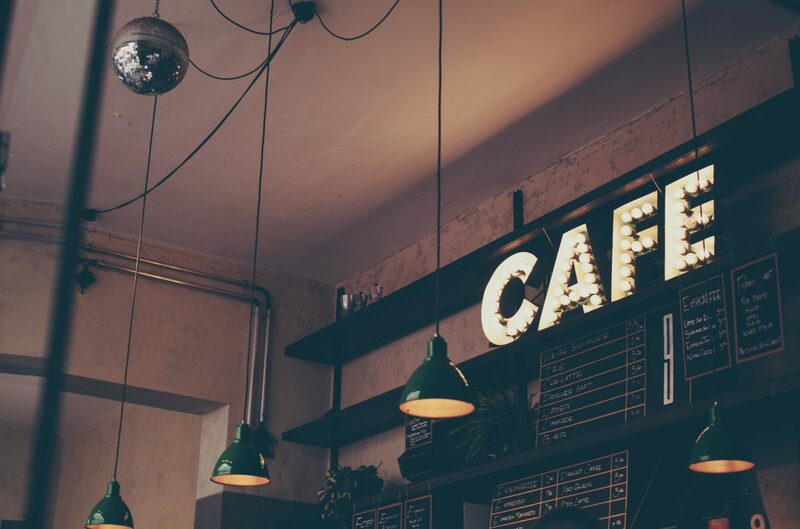 This cafe is constantly being praised as the best in the city. 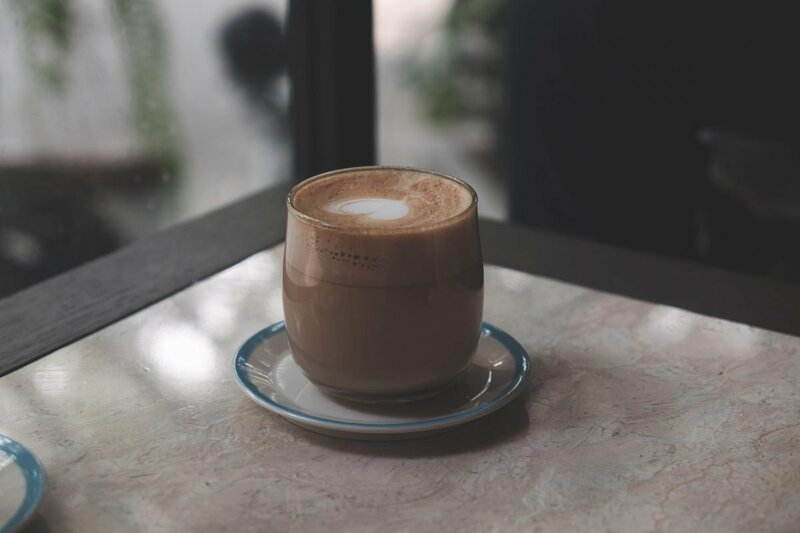 Coffee lovers have to make a pilgrimage here and enjoy some of their breakfast or pastry options, but seriously, the coffee. There’s almost always a line. They also do meals throughout the day, so come for an early lunch to avoid the crowds or simply grab a coffee to go. This cafe was right in the neighborhood of my Airbnb in Americana and every single day there was a line out the door. The food is outstanding and the prices are literally unbeatable for the quality and quantity of your meal. I loved their coffee, but the chilaquiles would bring me back here every weekend if I lived in Guadalajara. Watch My Food in Guadalajara Video! 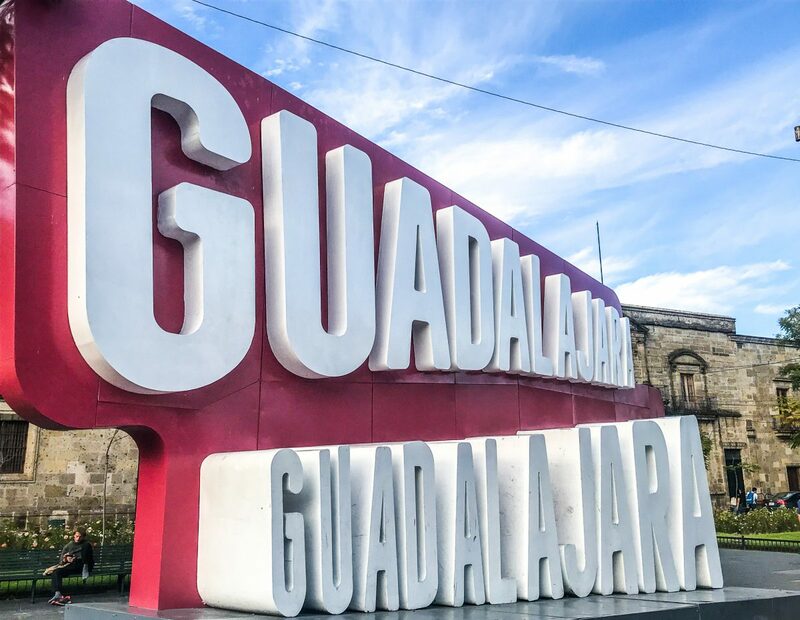 Read more about what to do in Guadalajara here!